The humble South Indian breakfast the idli has an interesting avatar, a colorful, seasoned idli the Kanjeevaram idli.. A slight variation from the usual idly. The seasoning the cumin seeds, Ginger powder , flavor of asoefotida and pepper gives a distinct flavor and nice taste to this idly. It is very delicious and easy to prepare. Wash rice and dhal and soak in water separately for 2 hours. Grind the rice to a coarse batter as of rawa consistency. Add salt and mix rice and dhal together and allow it to ferment for atleast 8 hours or overnight. Now the Kanjeevaram idly batter is ready. 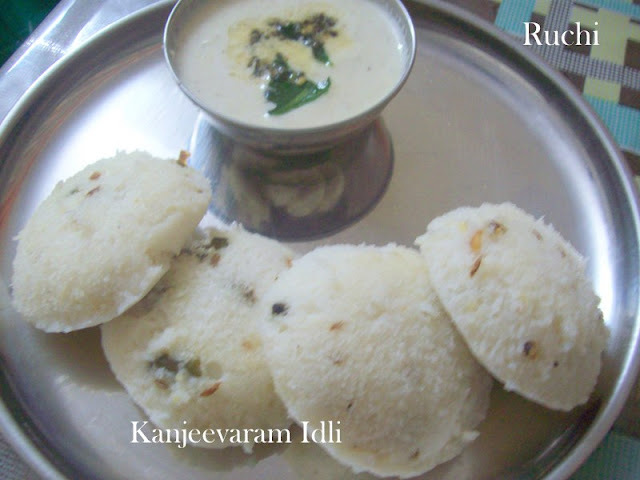 Pour the idly batter in the idly plates and cook it. 1. Take coconut, pottukadalai, chillies , tamarind and salt and Grind all the ingredients in the mixer. Perfect idli! Looks so inviting..
looks so soft, never tasted this before!